If you’re constantly frustrated after trying to walk more than one dog at a time, you’ll appreciate this practical advice. Walking 2 dogs at once can seem impossible if you aren’t experienced. Yet dog walkers and caretakers manage multi-dog walks (sometimes a half-dozen or more dogs at once) every day. If you want to be able to do the same, follow these tips. Using the same leash material may result in fewer tangles (or at least more manageable tangles). And using 2 leashes of the same length means you’ll have more control of both dogs. Nylon, leather and rope leashes are the easiest to use, side-by-side, when walking multiple dogs. 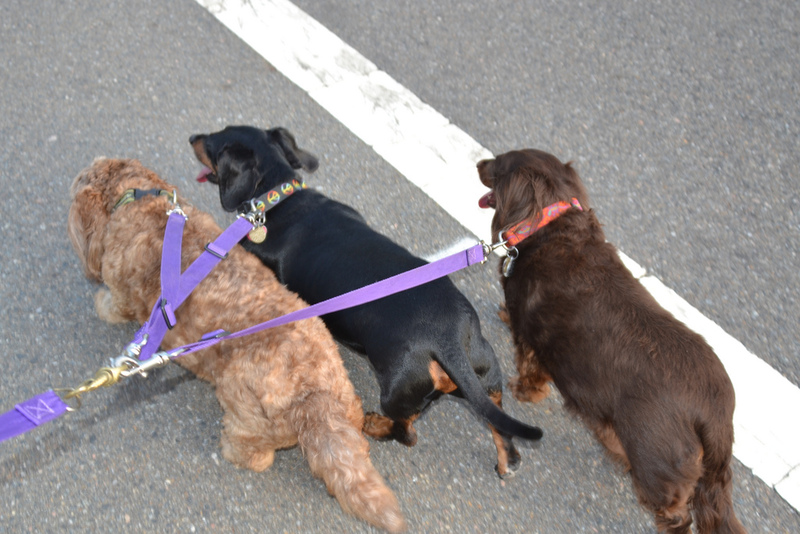 Chain leashes are difficult to maneuver if you’re holding more than one leash. If the chain gets wrapped around your wrist or the pup at the end of it, the chain can also pinch. Retractable leashes, although fun to use when walking one dog, can be a real headache when walking more than one. The narrow cord easily wraps around other leashes and gets caught on trees and bushes. It’s also tough to keep an eye on both dogs when one has considerably more freedom. This is especially a concern if you’re walking near traffic. Using 2 separate leashes isn’t for everyone. Sometimes the doggy duo is a little too enthusiastic with its crisscross walking pattern. Sometimes you just don’t have 2 hands to spare. This is where a coupler comes in handy. Couplers are essentially a leash splitter. Your leash attaches to a metal ring on the coupler and, from that ring, 2 short leashes extend to attach to your dogs’ collars. If you notice that your dogs are more vocal, assertive or even aggressive toward other dogs when walked as a team, they might be reacting according to a pack mentality. That is, they see themselves (you included) as a pack and are prone to behaving as a unit after taking cues from one member of the pack. Ideally, you want that one member giving cues to be yourself, but if one of your dogs is the first to react to a strange dog you meet, your other pup may follow in her grumpy footsteps. If you see aggressive tendencies forming, nip them in the bud as quickly as possible. You want your group walks to be fun, not terrifying. If you are concerned about pack aggression on group walks, research methods to train your dogs while out and about, or contact a credentialed trainer or animal behaviorist. Let’s talk frustration: Toto just pooped and while you’re struggling to hold on to 2 leashes and unroll a baggie to clean up his mess, George is pulling ahead like a charging bull. To make matters worse, after you’ve finally gotten a baggie, you now have to peel at the ends to find that impossible opening and now Toto is hauling straight ahead with George, tugging you impatiently as you try to work. Remove a couple of baggies from the roll. Open the bags up so you don’t have to battle with them on the spot. Tie them to your leash(es). When you have a mess to clean up, in one quick tug, you’ve got a baggie all ready. No matter how well you prepare for a multi-dog walk, it isn’t going to be much fun if you don’t have compatible walking companions. If you have an elderly chihuahua on one leash and a rambunctious pointer on the other, no one is going to benefit from the walk. The Chihuahua will always be lagging behind, and the pointer is going to miss out on much-needed exercise. 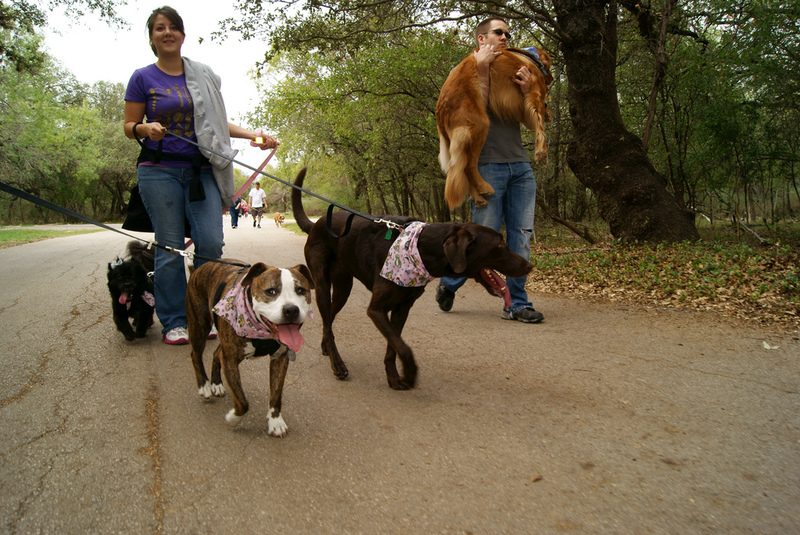 One final tip: Start off with short distances to get used to walking 2 dogs simultaneously. The walks will quickly get easier, and you’ll be having a blast in no time.